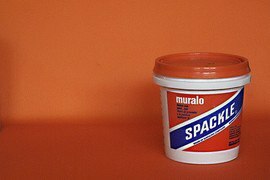 Spackle can be bought as a premixed paste or as a powder (that must be mixed with water). Lightweight spackle is for small projects/imperfections. Standard (all-purpose) spackle is for larger projects/holes. The vinyl and acrylic versions are very flexible. Epoxy-based spackle is known for adhesion and strength and is often used for repairing wood. A quart of spackle typically runs between $5 to $10.